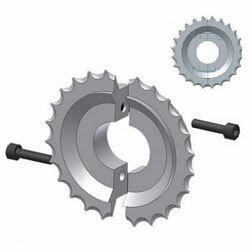 The Shaft Shark is a serrated edge disc, machined from high quality type 316 stainless steel. The internal diameter is machined to fit the shaft diameter of your boat - either metric or standard. Attached to your propeller shaft, it rotates with the shaft, cutting anything that might try to become entangled around your shaft and prop. Shark Shaft cuts through lines, nets and other underwater debris as soon as it catches. The correct model for your boat will depend on your shaft diameter and your propeller hub diameter. For example, if the forward end hub diameter is 4.00 inches then you will need SS500 as this cutting area has a diameter of almost 5.00 inches. The SS400 is just less than 4.00 inches so there would be no "cutting area" extending past the hub diameter to cut the line. Installation is simple and quick. No drilling or tapping and no need to remove the propeller for installation. Can easily be installed underwater by a diver. The Shaft Shark requires just a small clearance fore and aft between the cutlass bearing and the propeller hub (see dimension "D" in diagram below). This dimension allows for sufficient clearance with the cutlass bearing for shaft movement when maneuvering and for water-flow through the cutlass bearing. Always install the Shaft Shark as close to the propeller as possible.